Origin: Dinosaur Bichirs or Polypterus are prehistoric species and their origin dates back to the dinosaur age that is more than 60 million years back. Presently Bichirs can be only found in the freshwaters of African subcontinent. Bichirs have a snake-like body structure with large pectoral fins. The sizes for adult Bichirs can range from 11 inches to 28 inches. Bichirs can live up to 15-20 years if living conditions are great. There are mainly two profound categories of Bichirs. Erpetoichthys that consist of the subcategory E. calabaricus, generally termed as Rope fish or Reed fish. Polypterus contains a dozen subcategories based on their origin and features. Some of the popular species in this category are, the Guinean Bichir, Nile Bichir, Armoured Bichir, Congo Bichir, Saddled Bichir, Ornate Bichir, Marbled Bichir, West African Bichir, Senegal Bichir, Fat-headed Bichir. Bichirs are voracious eaters and predators. Their eyesight is poor and they rely mostly on their smelling senses to locate food. You can give a variety of foods to Bichirs, meaty treats and live foods being their favorite. You can feed shrimps, prawns, mussel, whitebait, silversides, worms and more varieties of live foods. They are also been found eating the foods of other tank mates with equal zeal. So, you can give them anything, live foods, frozen foods or sinking pellet foods to bring variety in their diet. Bichirs prefer being fed when your light is turned off. I recommend feeding them a quality sinking pellet. If they don’t feed on pellets right away you could starve them for a week and train them to eat pellets. The other option is to feed them live or freeze-dried food; this option can get expensive. 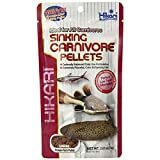 A pellet I highly recommend is Hikari’s sinking carnivore pellets. This pellet makes it easy to wean fishes off of live food. Another reason I like this pellet is that it doesn’t cloud your water (still make it a habit to remove uneaten food). For Bichirs, the height of the tank is not a problem. But you should choose for a wider tank with a larger footprint. For an adult-sized Bichir, a 180 gallons tank would be sufficient. If you need to check the size of your aquarium, feel free to use our aquarium volume calculator. Bichirs are usually not very sensitive to the pH level or other water conditions. So, normal tap water with neutral pH levels will go well with them. Also, for their Tropical origin, a water temperature of 24-28 degrees Celsius would be ideal. But you should not compromise with the water quality and install the best canister filter you can afford for improved water quality and air flow. Lighting should be dim as Bichirs are nocturnal in nature with sensitivity to bright lights. Many hobbyists prefer bare tanks for Bichirs. But, adding bogwood, smooth rocks, aquarium sand, pebbles or live weeds will be good as they might need a place to retreat or hide. Due to their slow movement and poor eyesight, some may think that they are incapable of catching live food. But the fact is that they can be really quick to target a prey and gobble it in no time. It’s not very difficult to provide good living conditions for Bichirs. So, they are favorites among hobbyists as they require little maintenance. But, special care should be taken while installing the filtration, lighting, and decorating items while tank set up. Time to time tank maintenance is also important to ensure optimum health for your Bichirs. Regular maintenance and a moderate level care will help them live longer. Bichirs are known to be aggressive towards other tank mates, be it from same species or another type of fish. They keep snapping each other and might be aggressive over food or territory. As far as you keep tank mates who are of the same size, the small disputes might not bother you much. Occasionally, you might find your Bichir to attack the larger species but that is not always a sign of aggression. It can be because of their poor eyesight that probably made them mistakenly considering it as a prey. I recommend large catfishes, datnoids, arowanas, and stingrays; anything that can’t fit inside of their mouth. Bichirs or “polypterus” got their names from the multiple fins on their back. The snake-like body and the tail fin helps them to swim fast when chasing smaller fishes in the water. Like gar fishes, bichirs also have a swim bladder that allows them to adjust in water with low oxygen levels. While setting up the tank, you must consider the fact that they are bottom feeders. Extra care should be given while choosing the substrates or decorating items for the tank. Also, a good filtration and tank maintenance at least twice a week is necessary to keep the water clean and free from the biological wastes they produce. So, you can opt for Bichirs for your aquarium if you can ensure a healthy environment for them. Make a little research and participate in discussions in different fish lover’s forums. You will get answers to all your inquiries and it will help you keep your Bichirs healthy for many years to come. can i put a senegal bichir in a 36 g bowfront? When it’s younger you can, but I recommend you upgrade or move it into a larger tank when it gets older (at the very least a 75 gallon), senegals can potentially grow to be 16 inches or so. My polypterus just survived an accidental temperature drop in my tank all the way to 55 degrees Fahrenheit! Slowly brought water back to 70 and they still seem fine. Very hardy fish. Can a Bicher be tank mates in a Flowerhorn? It’s always a hit or miss as each fish has different personalities. If you really want a higher success rate I’ve read that others introduce the two fish when they’re young and have them grow together. My recommendation would be to put them in the same tank BUT have a backup tank if it doesn’t work out. 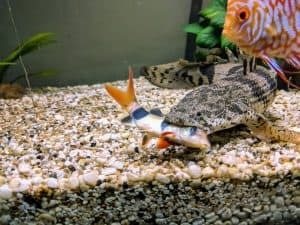 One more thing that’s a factor is your tank size, if you have a small tank I recommend you not stock a bichir with your flowerhorn as they are territorial fish. However, if you have the space by all means go for it. Can you put a dinosaur Birchir in a community tank that contains guppies, tetras, barbs, etc? I wouldn’t recommend doing so. The only fish left in that tank would be your bichir; not instantly but over time you’ll notice these fish start to disappear. 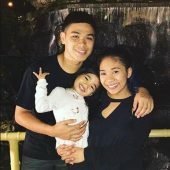 Angel fish and pleco… compatible? right now my 2 gray senegal’s are maybe 3in long. about how fast is their growth rate? I would really like to get a senegal bichir or two but my tank is only about 45 gallons or so and I’m worried that’s too small. I have seen minimum tank sizes from like 40 to 75. That’s a fine size while they’re small. They do take a while to grow to their full size. I read stories of people keeping them in small tanks and stunting their growth but I don’t advise doing this. dino bichir in a 60 gallon with a green terror, jack dempsey, orange sevrum and a convict cichlid sound OK? Assuming your convict is full size, should be okay. As long as your convict can’t fit in its mouth. Would a dinosaur bircher be compatible with a angel fish, guarmi , beta and 2 eels? Your betta fish may end up missing. I don’t recommend putting anything in the tank that can fit in the bichirs mouth. Can i keep bichir with pacu, red tail catfish, pleco and iridiscent shark? As long as it can’t fit in any of their mouth, your bichir should be fine. Could I mix a bichir and a leopard bush fish and angels in a 75? Assuming they’re around the same size, yes. Can I get a 3 inch bichir and put it in with my 7 inch bichir? How often do you recommend feeding bichir? I generally feed my fish once a day (in the evening) but I’m wondering if smaller feedings more often would reduce their desire to eat tankmates. I intend to move 2 bichir to my 80 gallon community tank but would be heartbroken if they ate my clown loaches. I think the angelfish, catfish, pleco, & shark in there will be fine. It would lessen the chance, but there’s still the possibility. Maybe small feedings throughout the day then a large feeding before bed? If you’re positive your loaches can’t fit in your bichirs mouth I’d do the move, if not I wouldn’t chance it.